Omnivision Studios BV announced the launch of Omnitapps Composer, the newest addition to the Omnitapps multi-touch software suite. Designed to bring further simplicity, customization, and reliability to multi-touch deployments, Omnitapps Composer offers up to 21 easy-to-configure applications for creating highly captivating, interactive touchscreen experiences within any public setting. The Omnitapps Composer suite include Omnitapps Composer Basic, a multi-touch software package with 18 applications and basic setting configuration; Omnitapps Composer Advanced, a full-featured multi-touch software package with 21 applications; and Omnitapps Composer Ultimate, adding Omnivision's Interactive Wayfinding application to Omnitapps Composer Advanced. In addition, Omnitapps Composer Player offers a cost-effective system for running any configuration created using Omnitapps Composer, Basic, Advanced, or Ultimate. "With Omnitapps Composer, we set out to create the most complete and cost-effective set of multi-touch software applications on the market," said Alexander Aelberts, CEO, Omnivision Studios BV. "The three options provide endless interactive possibilities for creating engaging touchscreen experiences that provide strong brand reinforcement and highly enhanced communications. Users can tailor the application to suit any look and feel for audiences in a wide range of spaces from building lobbies to shopping malls to airports." The Omnitapps suite is ideally suited for any location that requires the ability to communicate with users and customers in a highly intuitive and interactive manner. Omnitapps customers have installed compelling multi-touch screen applications in settings as diverse as retail shops and showrooms, education and training facilities, TV studios, fairs and conferences, hotel and hospital lobbies, museums and exhibitions, and real estate centers. These touchscreens are used for everything from generating traffic and attracting new customers to welcoming and directing visitors, communicating product information through digital brochures, entertainment and presentations, and training. Omnitapps Composer entirely eliminates the need for any programming - enabling more user-friendly workflows within any multi-touch environment. A redesigned configurator makes it even easier to create stunning custom graphical interfaces. Omnitapps Composer supports 15 languages, enabling users to fully configure language settings while displaying content in any language to suit the audience. With the Omnitapps Interactive Wayfinding application, users can easily create a completely customized wayfinding solution by simply importing a high-resolution floor plan and their CSV database. Omnitapps Composer also includes data collection forms for capturing valuable information regarding touchscreen usage. 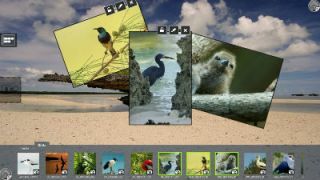 The software supports resolutions ranging from 1366x768 to 4k and is ideal for kiosks, single/multi-touch screens, touch tables, touch video walls, and all-in-one computers. Adaptable to both multi- and single-touch requirements, Omnitapps Composer is compatible with Windows 7 and Windows 8 environments. Omnitapps Composer delivers further savings through free updates and by offering a single price for a total of 21 applications. In addition, Omnivision provides free customer support.